Self help for anxiety is about finding out what you can personally do to overcome anxiety and that's exactly what I want to share with you in this article, I want to give you some tips and advice that will help you to overcome the feeling of anxiety. Anxiety is something that affects us all in one way or the other, although it affects us all at different levels, we all at one point or the other in our lives will be faced with feelings of anxiousness, worry, and nervousness. Anxiety is that feeling of uneasiness, that feeling of uncertainty that results in us worrying about what the outcome of a particular situation will be. The list of things that cause us to become anxious can go on and on. 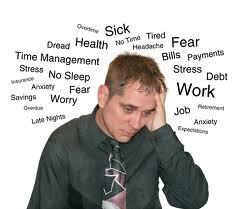 While its normal for us to get anxious, it can become dangerous if those anxious feelings are not properly dealt with. When not properly handled, anxiety can lead to stress and depression, that feeling of helplessness can lead us down a vey dark road causing us to make bad decisions. So how can we better cope with anxiety? Here are 10 self help for anxiety tips (in no particular order), these are based on my personal experience with anxiety and the coping mechanisms that I use. Worrying doesn't fix the situation, the only thing worrying does is gets you more stressed and it keeps you focused on the negatives, so don't worry, relax and pull yourself together, remember that every problem has a solution, because you haven't yet found the solution doesn't mean it doesn't exist. Often times we stress ourselves over unnecessary things, the solution is often right before our eyes but we are too worried and stressed out to see it. Rather than focusing on the problem or issue, look for solutions. We often get worried and anxious because we don't know what to do. Think back to the times when you have been anxious about something, what got rid of that uneasiness was when you finally found a solution. Solutions get rid of worry, we worry because we don't yet have an answer, but once we have that answer it's like a weight has been lifted off our necks. What we have to learn to do in times of anxiety is to take our focus off the problem and shift our focus on trying to get the solution instead. Don't be afraid to share your worries with people, by talking about it and letting others know what you are going through, they might be able to point you in the right direction. If you keep it to yourself you will suffer alone and worry yourself to death. People can only help you if they know what you are going through. Often times we feel ashamed to discuss the issues that are causing us to be anxious, for fear of how it will make us look, we don't like to feel vulnerable, we don't want people to see us as weak or as a failure so as a result we keep the problems to ourselves. Don't be scared to received help, there is no shame in asking for help. In this tough season where many are losing jobs etc one of the biggest areas of anxiety for people is money. These are the questions on the minds of many, not having money and not knowing how you are going to survive can lead to major anxiety and stress. In times like these don't be scared to ask for help and receive help. If it means turning to the government to receive welfare and benefits, then don't be too proud to do that. If it means having to ask friends and family to support you financially so that you can stay afloat until things settle then do that. Ask for and receive the help that is at hand. It doesn't make you any less of a person, it's just a temporary solution until you are able to stand on your own again. Don't worry about the things you have no control over. Sometimes we get anxious over the things we have no control over. Why worry about the things you can't change or influence. It doesn't make any sense. Do the best you can and leave the rest to God. All you can do is your best, do your best and don't stress over what is beyond your control. Expect the best but mentally prepare yourself for the worst. While its good to remain positive and optimistic about the things you are anxious about, it's also a good idea to have a plan for the worst case scenario. The truth is that things don't always go our way, the worst can and does happen. One of the best ways to cope with anxiety is to ask yourself what is the worst that can happen? And then have a plan for recovery if the worst was to happen. It might mean having to start from scratch again, it might mean having to make cuts, giving a few things up, taking few steps back, even moving back with family. There is no shame in having to rebuild when things go wrong, often we magnify situations worse than they are, for example even if you were to lose your house and had to move back with family, yes it's a big blow and and a big disappointment but is it really the end of the world? Always look on the bright side of life, no matter how bad you think you have it, somebody somewhere has it a lot worse than you. You're worried about losing your job, someone already lost theirs, some lost theirs 5 years ago and are still struggling to get another one - you are in a better position. No matter how rough you think your life is, someone somewhere would give anything to even enjoy the little you think you have. So be grateful and thankful for the things you do have and don't worry yourself too much about what you dont yet have. While someone is complaining about not having shoes, someone else somewhere is wishing they had legs - at least you have legs. Always look on the bright side, try to find something positive in every situation that makes you anxious. Have patience. Anxiety is sometimes a result of impatience, we get anxious because we become impatient, we want instant results, we want to start a business today and start making millions tomorrow, and when the million don't come straightaway we start getting worried and anxious thinking maybe we made a bad move. Remember you can't rush a seed to turn into a tree, it takes time, whether you like it or not, whether you want it to or not, there is always a time factor, and things usually get sorted out with time, things heal with time, things grow with time. Be patient not anxious, don't let your anxiety cause you to make a bad decision and quit too soon, if you hang on just a bit longer the results will come. The worst thing to do is to give up on the verge of your breakthrough - anxiety can cause you to do that so be patient. Seek Gods help. One of the best ways I handle anxiety is by doing what the bible says in the book of Philippians 4:6, it says "don't be anxious about anything, but in everything by prayer and petition, with thanksgiving, present your requests to God. I don't know about you but I believe in prayer, I believe there is no problem I am facing that is bigger than God. So rather than allowing anxiety to take over me, I turn to God in prayer, I tell God about those issues, and trust him to give me a way out. In fact there is another verse in the bible that tells us to cast our cares and worries and anxieties on God because he cares for us (you can find that in the book of 1 Peter 5:7) God knows that there are certain situations that will be too much for us to handle, so he wants us to hand them over to him and allow him to carry those burdens for us through our prayers and trust in him. Further more, God guarantees that if we put him first in our lives, we will have no reason to worry because he'll take care of our needs. In Matthew chapter 6:25-33 he tells us not to be worried or anxious about what we are going to eat, or what we are going to wear or where we are going to live etc, he said that he knows all our needs and all the things we are worried about, but if we put him first he'll take care of everything. God even guarantees those who love him and put their trust in him that even if the worst was to happen, he can still turn the worst of situations around in their favour - Romans 8:28 says that all things work together for the good of them that love God. Turn to God and he will help you to overcome those things you are anxious about. As long as you still have life, you still have hope. Anxiety can often be birthed out of a situation that seems hopeless. You look all around and you just can't figure out where the answer or help is going to come from. There's an old Yoruba proverb that says "as long as you still have life, you still have hope"
Haven't you heard of people who have been in what seemed like hopeless situations, they lost their money, their home, their jobs, everything. Did they have reasons to be anxious and worried? Of course! but somehow they were able to come back from all that and make a success out of themselves. Be anxious about nothing, even if the worst happens there is still hope for you, as long as you don't give up on life and as long as you don't give up on yourself there is always hope - as long as you have life, you still have hope.